Just a few days before Christmas, on December 23, 1933 a young woman dressed in a navy blue skirt and shoes with a white blouse and a floral-print scarf draped casually around her neck was seen at the Greyhound bus station alone. Later she asked the ticket officer for travel and fare information to Eerie, Pennsylvania, and Elmira, New York. She then asked about a ticket to Willoughby – which she purchased rather nervously. After she arrived in Willoughby, she is reported to have spoken with a local gentleman who offered her help, and with his guidance she checked into a boarding house owned by Mrs. Mary Judd right in the downtown area. She did not leave a name when checking in. Mrs Judd recalls her saying her name was “Kate”. After arriving at about 8pm she went directly to her room to sleep. The next morning, she woke early and spent some time reading in the rest area before breakfast was served. During the breakfast, Mrs. Judd told her how to get to the main bus station, as well as the local church. After that, she headed down the front porch stairs and headed off toward downtown at about 11am. One hour later, she returned to the boarding house, looking a “Little worried” and headed directly to her room. As she returned downstairs, her suitcase was clutched tightly to her side. Quickly she thanked the landlady for her hospitality, returned the key to her room and paid for her stay. The girl was seen one block south of the boarding house heading along a street that led her past the cemetery by a number of witnesses. They all said that she continued walking down the street until she reached the end. Then she purposefully stepped into the copse of maple trees and vanished from sight. Emerging the other side of the woods, she was faced with the railroad tracks stretching off into the distance. Suddenly, there was an eastbound flyer heading to New York barreling down the track at her doing about sixty-five miles per hour. She was seen to drop her suitcase and then she sprinted toward the tracks. A glancing blow from the train sent her slight body hurtling through the air, landing on the gravel siding. Her short-lived life was tragically over. When her body was recovered by the local authorities a short while later, they were astonished to find no blood or visible wounds on the young woman. They carefully checked her body for identification and found none. Searching through her purse, they found coins (90 cents) and a railroad ticket to Corry, Pa, a handkerchief, the usual trinkets and makeup a woman would carry, but no form of identification. After a search of surrounding brush, they found her leather suitcase. Inside, they recovered a towel, a few crudely sharpened pencils and some envelops, but none of these things offered any clue to the girl’s identity. The local authorities unable to discover her identity or the exact motives that had caused her to meet her death. Later they removed her body to the local funeral home of James McMahon. Upon his examination, Mr. McMahon concluded that she had died from injuries suffered during the train accidents. The exact cause of her death was listed as a fractured skull. He estimated her age at about twenty-three. She was five feet, four inches tall, 135 pounds, with reddish brown hair and hazel eyes. He noted that she had straight teeth, high cheekbones and may have been born of foreign parents. Mr McMahon decided to give her a proper funeral. Many people came to pay their last respects to the Girl in Blue, but no one seemed to know her identity. The story about her tragic demise began appearing in more and more newspapers, and families called from near and far desperate to find their missing loved ones, but she was never claimed. Surprisingly, more than 3,000 local residents visited her funeral to pay their respects and see if they could identify her. 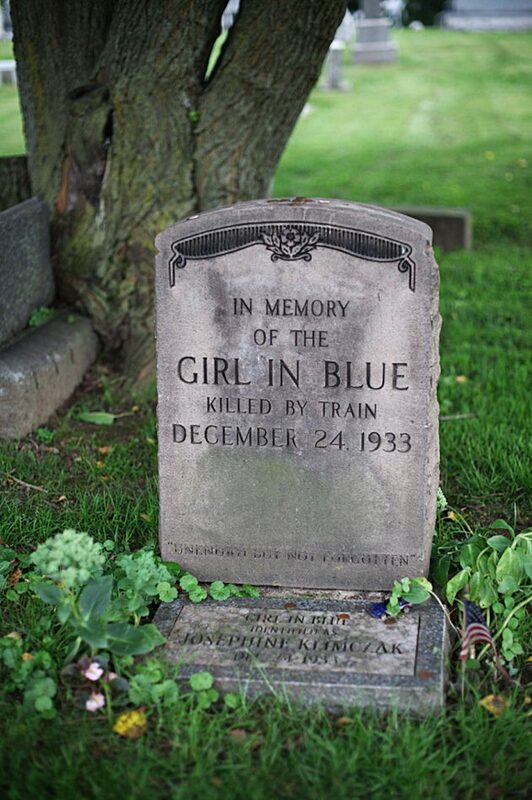 In December 1993, her true identity was revealed when The News-Herald published an article marking the anniversary of the “Girl in Blue’s” death. The article was read by Pennsylvania real-estate agent Ed Sekerak, who recognised the girl. He had been selling the Klimczak family farm in Spring Creek at the time. His report checked out, and it was discovered through court records that the mystery girl was Josephine Klimczak. Upon learning that Sekerak could confirm the identity of the Girl in Blue, Willoughby lawyer William C. Gargiulo came forward and asked that Lake County Probate Court Judge Fred V. Skok to officially recognize the true identity of the girl. However, questions of whether she had committed suicide or was racing to catch the train lingered. Also her purpose of visiting Willoughby still unknown.